I spent all morning with the Belmar Arts Council helping with a big clean up at the Boatworks (those interested in the details of that can find them here) then drove up to the Studio around noon. After lunch I got to work on the Global Footprints project. 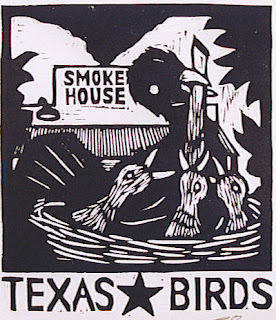 Of all the things that I had done already, I was leaning toward using the color version Texas Birds print, since it can fit the theme and it had been created for an event at the Printmaking Council anyway, but I'm wondering if I can't make something more interesting. Either way, I'm going to send something in the frame that currently contains a copy of that Birds print, so I started box construction today. Did the inner box (top photo) and set it aside. What I came up with is a square compostion, which will have some 50's style young children in the center on a background of a perfect green lawn. Surrounding them on all sides will be examples of various things used by homeowners (past and present) to defend that square of perfection from all the critters that would seek to enter it. Bug sprays, weed killers, mouse traps, etc. 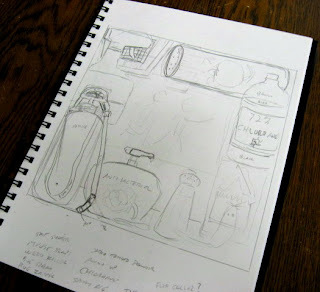 Some objects were (temporarily) drawn from memory, others were found in workrooms around the basement of the Studio building. 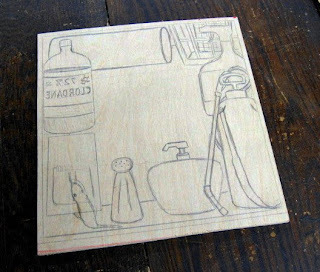 First I did a quick sketch on paper, then started transfering it to a 9" square block. The block as seen here will require some minor changes, and the addition of lot more details, but I think it can work. I'll continue it tomorrow. It pretty much has to be done in a few days if I'm going to make the deadline. Otherwise, I'll ship the print that I have. Had a busy afternoon, all taking place after a full day of work at my day job. First I stopped by the Studio briefly, then walked a few blocks into Asbury to get some more details on the upcoming Arts Festival. I had finally heard from my gallery contact a few days ago (some e-mail issues caused the delay) inquiring if I was still in and what they had in mind for my work. I visited the space yesterday, then spoke on the phone to the owner this morning. I passed this information on to the organizer this afternoon and got some details, but I'll save those until next week. From there, I dropped by the Boatworks to see if a scheduled event was going on. It wasn't. I discussed some upcoming events with our new intern, then moved on. After I got home I realized that I had forgotten to stop for groceries on the way, so I took a walk downtown to pick up what I needed. And in that supermarket, I saw something odd. I watched an employee move a large ladder down the aisle I was in, and decided I'd better follow that ladder. It was set up behind the customer service counter, where the employee then climbed it and over an adjacent wall, into the manager's office. Apparently the closed door could not be opened from the outside. (locked with the keys inside? broken?) 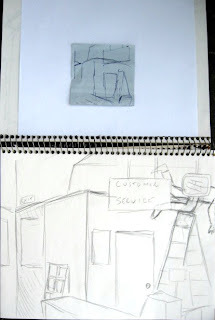 Naturally, I found a scrap of paper and quickly did a basic sketch of the scene (top half) and drew a rough expanded version in a sketchbook when I returned home (bottom half). I need to think about it a bit, see what might be added to the scene to make it potentially more interesting. But it looks like a good possiblity for another supermarket print. I have a few more details about the Iowa show. The exhibition will be in the gallery on the campus of Upper Iowa University in Fayette, IA. 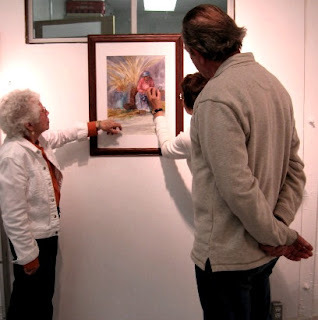 The show will be on display from November 12 to December 10, 2008. Still have to figure out what will be in the show- I'm guessing highlights from some of my more popular series, but there is an interest in getting a few of the larger pieces out there, too. As always, I expect that there will be a new print or two debuting at the show. Also still to be worked out- title of the exhibition, reception date and time, and if I'll be making an appearance in Iowa. With all my midwestern relatives back home in their respective states, today I was able to get back into the Studio for the first time in quite a while. Today's focus was on the upcoming Global Footprints show at PCNJ. Last time I wrote I said that I didn't have anything recent that addressed the topic. But I gave it some more thought over the past week or so and realized that maybe I did. Above you see the black and white version of Texas Birds (recently colored version and backstory can be found here ) It would seem to deal with human influence on wildlife. 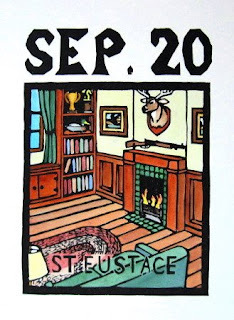 Another such option would be St Eustace, with its reference to hunting animals. Both are in frames, and are small enough to be practical to ship, which these days is a lot cheaper than the gas I would use delivering it myself. But I'm still wondering if I can come up with something new for the occasion. So in the Studio I spent a few hours skimming news items for inspiration, brainstorming, sketching. I have an idea or two that might work , though everything is still too embryonic for me to mention or show right now. By the end of the week I either need to have at least started a new block, or started making a new custom shipping box. Now that the semester is over, I have a lot more evenings free. Tonight I decided to go check out the figure drawing group that meets at the BAC Boatworks. I brought an 18" x 24" pad and charcoal. I skipped the gestures, and did several 15-20 minute drawings. The one shown is a 15 minute drawing, my best one of the night. Not too bad, considering it's been almost a year since the last time I drew with charcoal. The other artists there seemed to really like it (and the other drawings I did), citing the boldness of the marks and general power of the drawings. 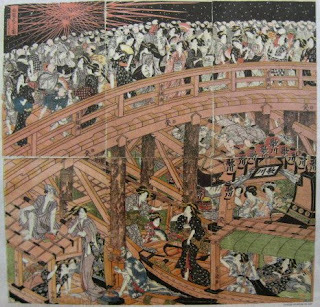 One even compared this one to a Japanese woodcut, not knowing anything about my history with woodcuts. 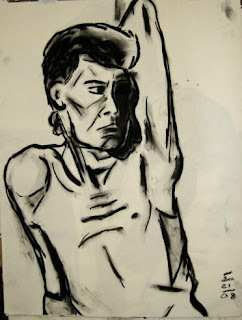 I don't think it's an accident that my charcoal drawings look a little like woodcuts, just as my figure/portrait woodcuts look like charcoal drawings- it's all about the marks. The Printmaking Council of New Jersey will be having an open members show this summer, called Global Footprints. All members are invited to contribute an artwork relating to people's effects on nature: use of land and water, pollution, endanged species, global warming, preserving wilderness, etc. Work can be any print related process, photography, digital, papermaking, or book arts. All work must be delivered by June 7, and the opening reception will be Saturday, June 14th. The show remains up until early August, then will travel to at least two other locations. To find out all the specifications, check out the online prospectus. If you're not a member, but are interested in the environment and printmaking, you can join the organization on the same entry form and be part of the show. In my case, it's an area of interest and I have done work in the past that could fit this theme, but those works are way to old to be eligible, not to mention having been shown there before. I just learned about this show last night (when my prospectus arrived in the mail), so I have about 2 weeks to create something if I want to be a part of it. I'll give it some thought over the next few days, and if I come up with an interesting idea, I'll get it going in the Studio after the Memorial Day holiday and all the chaos it brings to those of us on the Jersey Shore. Spoke to my friend John Siblik today. When I called he had just pulled a big beautiful homemade rhubarb/apple/raspberry pastry out of the oven, so he asked if he could call me back later. This he did, and we discussed my planned exhibition at his school in Iowa this fall, along with other important topics (music, teaching, pork rinds, and the aforementioned baked item, which he reports as being exceptionally delicious). He's supposed to get back to me in the next few days with some specific details about the gallery and dates. I'll post that information here and on my website when I have it. During the spring semester I taught a class on Wednesday evenings, so since January I missed out on the monthly Critique group that meets in the Studio. I'm looking forward to the June edition, but that's still a few weeks away. Meanwhile, tonight I decided to check out the one established at the Belmar Arts Council this spring (word of our group in Ocean Grove inspired the folks in Belmar to get one of their own going), another thing my work schedule prevented me from doing until now. I brought the framed copy of A History of Art that was last seen in my March show at Georgian Court. It got a great response, the comments largely about the level of detail and the complex planning that went into it. I'll also show it at the one we're hosting in the Studio in June- it's been hanging on the wall there during the last few meetings, but I haven't been there to talk about it, and I won't likely have any other new signifcant work to show before then. I didn't go in to the Studio today, mostly dealing with work around the house and Mother's Day stuff, but I got a little art done. I did my usual Sunday morning shopping, and while getting a box of cereal, remembered that I was thinking about that aisle as a location for the next supermarket print. 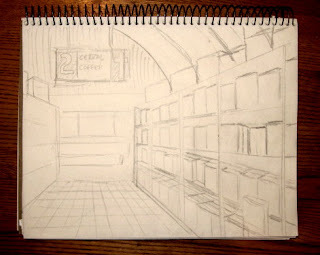 So I did a quick sketch of the aisle, looking toward the back of the store, on the handiest piece of paper I could find, a receipt in my pocket from yesterday's flower shopping. 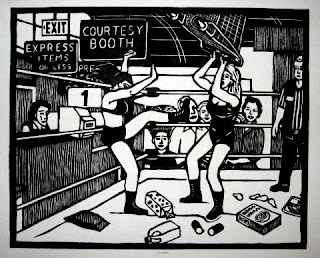 When I did the first 8 prints in the series, I actually brought the blocks of wood into a supermarket where a co-worker had a part time job, and did sketches of architecture and store fixtures. 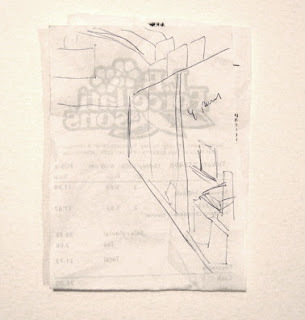 I'd sit the block in the toddler seat of a shopping cart and draw. And if anyone questioned what I was doing, I could just send them to my friend the shift manager. But after that, I would do little sketches like the one on the receipt, and apply what I learned doing all the previous prints to fill in the spaces. Figures and other details would be added later. It may be a while before I get to doing the block drawing itself, so while it was all still fresh in my mind, I did a more detailed drawing of the scene in a spare sketchbook. This isn't necessarily final, but it's a good starting point. I like the piece of the curved roof overhead- it's part of the actual store architecture, but it also could be reminiscent of church architecture, say a barrel vault over the nave of a cathedral. A good association for a religious themed image. I'm assuming that a preacher type will be in the aisle, though I don't know what the figure will be doing yet, and I haven't thought about other figures yet. No hurry. By the way, although many of the 20 prints done so far in this series are set in this particular supermarket, the large curved roof usually isn't shown, mostly because the selected view didn't show the roof overhead. But it did make it into one previous print, Scenes from the Grand Opening #15 (bottom photo), where we see it adjacent to the front window. I wasn't necessarily planning to go to the Studio today, but then in the early afternoon I got a call from Molly, telling me she was heading up there, and I got the impression that she would appreciate some company. I did have some errands to run, but I went to the Studio first. Molly was already there working on a commissioned project, and it gave me a chance to give her some music news that I knew would interest her, find out how things went with this past week's critique group (very well it seems), and discuss some end of the semester teaching stuff and some other art related topics. While all this was going on, I was continuing to give thought to the new print project I mentioned in the last post, related to the Japanese print. I'm still in the note taking stage, nothing to say here yet, much less sketches to show. Some ideas lend themselves to quick resolutions and the blocks get started almost immediately. Others are like what I was working on today, just lots of thinking, taking notes (words, not images), trying to draw on my accumulated memories. This is even more important than research, because it deals with those specific details that made the most impression on me- and thus the most significant details of the central idea. Once I have used those key details to work out the basic structure of the print (or series), I will then do whatever research is needed to fill in the smaller details that add layers of meaning, as well as provide additional areas of interest for both me and the viewers. But all that is a long way off. In the short term, I have to finish all my class grades, but that will be done early next week. Since I don't like going long periods of time without anything to work on, I'll likely get going on a simpler print soon after, perhaps the supermarket print I also mentioned last week. I should scout some locations when I'm doing my weekly shopping tomorrow. Or maybe a new saint, taken from past notes. Another busy week passed with me not getting into the Studio. I wasn't sure I was even going to get there today, but I was able to take care of my errands and was there by late afternoon. 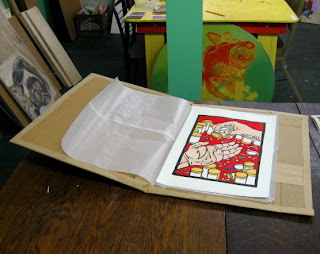 One task was making a cardboard folder (top photo) to safely carry a print to a potential purchaser this coming week. 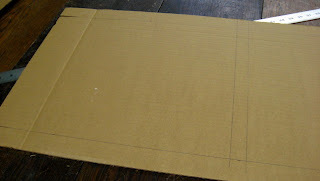 Just two pieces of cardboard trimmed to size, paper tape used to make a hinge and along the edges. Mostly I was working on ideas for some new prints. The other image here, a scene made from 6 woodcuts by 19th century Japanese artist Utagawa Toyokuni, is related to a possible new series I hope to start later in the summer, and I was taking some notes regarding that today. But I'll save the details until that's ready to go. Meanwhile, I was also working on ideas for two established series. The latest issue of local weekly The Coast Star had some strange stories in it, such as a piece about a series of ocean dumpings around Monmouth County of animals (chickens, ducks, goats, lambs, etc) sacrificed in religious ceremonies. Interesting, but not something that seems an inspiration for one of my prints. However, there was also a supermarket story that has possibilities- a local man was arrested for placing religious messages inside various supermarket products (mostly cereal boxes) at supermarkets all around Wall. I prefer to go with events I actually witnessed, but I'll make an exception in this case- all the stores are ones that I have shopped in, including one I was in today. Today I also gave thought to some possible saints. This coming week is a busy one again- last week of classes, all the final grading- but after that I'll sit down and begin serious work on a new print or two.